Beautiful RARE certificate from the Packard Motor Car Company issued on October 29, 1929. 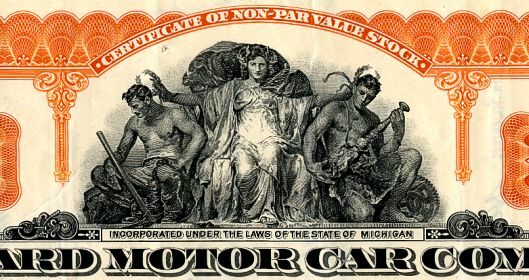 This historic document was printed by American Banknote Company and has an ornate border around it with a vignette of a group of allegorical people. This item has the signatures of the Company's President and Secretary and is over 79 years old. 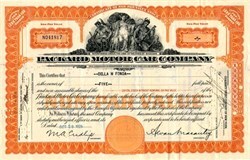 This is the only certificate we have had for sale issued by the Packard Motor Car Company on October 29, 1929. October 29, 1929 (Black Tuesday), was the beginning of the Market Crash and Depression. Within the first few hours the stock market was open, prices fell so far as to wipe out all the gains that had been made in the previous year. A then-record 16.4 million shares changed hands, causing bedlam on the floor of the New York Stock Exchange as investors sent in orders faster than traders could possibly fill them. The Dow Jones Industrial Index closed at 230. Since the stock market was viewed as the chief indicator of the American economy, public confidence was shattered. Between October 29th and November 13th (when stock prices hit their lowest point) over $30 billion disappeared from the American economy. Banks and brokerages went out of business. The broader economy completely collapsed, putting many Americans out of work for years. It took a long time and a world war for the markets to recover. Initially, the Packard sons, William Doud Packard and James Ward Packard, established the Packard Electric Company in 1890 in Warren, Ohio. Once the Packard automobile became successful, Warren became the first city in the United States to light its streets with incandescent light in 1911. Packard Electric Company manufactured incandescent light bulbs and other electrical products. Once the Packard automobile production was established, the Packard brothers established an improved electrical system for the automobile. In 1932, Packard Electric became a division of General Motors Corporation and is called Delphi Packard Electric Systems today. Delphi Packard Electric is recognized worldwide for excellence. The early Packard automobiles were known for their quality construction and handsome styling. The early Packards are recognized for their classic styling and are very popular with today's collectors.